My camping stories about my adventures and mishaps camping in the great outdoors. My first camping experience was at a Church family camp. My friend who was a counselor for a Youth club called Pathfinders invited me to come with her. She pitched (put up) one of the clubs tents for me. It was a canvas tent and I had never seen a tent put up before. I thought she was amazing. I enjoyed the experience so much that I eventually joined the club so I could go camping again. My third time camping was when my husband decided to volunteer to be the Director of the Pathfinder club. We went to a local camporee two months after he became the leader. He had never put up a tent before. The other Club leaders had to help him set up our club's tents. 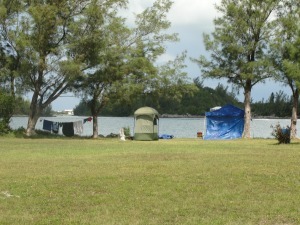 They put our club in the windiest site on the Island, which is now my favorite camping site. When every one was asleep in their tents the wind came up the rain came down and so did our tents. My husband was running around outside trying to keep the tents up, while the pathfinders where standing out in the rain. I stayed in the Director's tent with my two children who where 8 and 5 at the time. The tent came down on top of us, and we lay there until they put the tent back up. My children slept through it all. The other club leaders came running over to help us. The next day they moved us to a calmer site. My husband says that's when he learned how to put up a tent. Because as he got one tent back up another one would go down. Now my husband doesn't go camping until I have gone and set up camp first. He hates the hassle, but I don't mind. I LOVE CAMPING!!!! 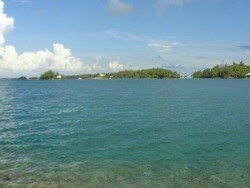 I like camping on Islands off the main land. My favorite site for tent camping is on Darrell's Island. It can be a hassle because it requires a lot of packing and unpacking. You pack the car, than you unpack the car at the dock, you load the boat, than you unload the boat and load the trolley that the caretaker uses to cart you're camping gear to the campsite. Then you unpack the cart. My husband hates this. Most who know me know that I LOVE CAMPING!!! Now if I can just get my sons and their spouses to love it I'll be alright.